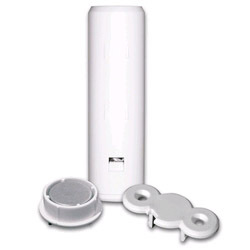 The 56A00-1 Wireless Recessed Door Transmitter from HAI is used for protection of doors and windows in installations where the transmitter and magnet must be totally hidden. The supervised transmitter and contact are concealed within the door or window frame for virtual transparency. It works with the HAI 45A00-1 Wireless Receiver and is supplied with a replaceable lithium battery that lasts for 5 years under normal operation.